In her job as a United States Foreign Service Officer, Victoria Tyszka Cedeño ’06 knows diplomacy and policy-making are a team effort. Still, one of the best feelings she gets is when the Secretary of State or Ambassador to the United Nations reads a speech she wrote. 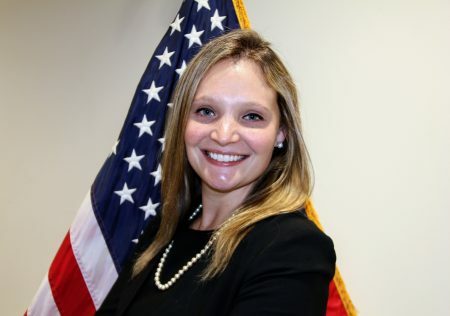 Cedeño has worked for the U.S. Department of State for seven years and currently serves as a political officer for the U.S. Embassy in Ouagadougou, Burkina Faso. She has lived in the African nation for almost a year now and has also completed assignments in Lebanon, Colombia, and the United States. Though the job requires extensive travel, Cedeño embraces the opportunity to see the world and explore different cultures. In fact, being a frequent traveler is nothing new for Cedeño. As the daughter of a French mother and American father, she grew up bilingual and bi-national. She lived in Paris until age 14, when she and her family moved to Detroit, Michigan. At Randolph, her fascination with other cultures grew, and her professors and study abroad experience in Prague gave her new perspective about the world. After earning a degree in international studies and political science, Cedeño joined the Peace Corps and served as an education volunteer for two years in the Islamic Republic of Mauritania. She then returned to the United States and earned her master’s degree in international affairs from George Washington University. In her three internships there, she was particularly fascinated by the energy sector and its role in the global economy. Following graduate school, the State Department was one of five career paths Cedeño was considering. Today, she can’t imagine doing anything else.